Uee of “Ojakgyo Brothers”, Jin Se Yun of “Bridal Mask“? The “love” of actor Joo Won recently become a hot topic. In the KBS2 weekend drama “Ojakgyo Brothers” early this year, he showed close relationship with singer-actress Uee, triggering the rumor of romance. In KBS2 Wednesday and Thursday drama “Bridal Mask” premiered on May 30th, 2012, he will form a love line with Jin Se Yun. In the production press conference of “Bridal Mask” held not long ago, Joo Won was praising Jin Se Yun. He said, “When director Yoon Sung Shik was casting for the role of Mok Dan, I felt Jin Se Yun is more suitable than anyone else. Se Yun is the most suitable. She is a very lovely friend who the mood will become very good when arrived on the shooting set.” And he laughed. The face as big as a fist, the sturdy body with golden ration, the face of “true heart man” Joo Won always filled with smile. When suddenly asked, “What’s the relationship with Uee?” He said, “Too many people pays attention, making us feel like not convenient, and a little embarrassed,” quickly ended it. Actually, the image in “Bridal Mask” is different from the past, and Joo Won is showing various expressions acting and the charm of strong eyes’ expression. “Bridal Mask” is a hero story sets against the background of Japanese occupation period in 1930s. In the drama, Joo Won is playing the role of second son of independent activist Lee Kang To. “Bridal Mask” is the history of our country. The information about “Bridal Mask” can be found on every web pages. 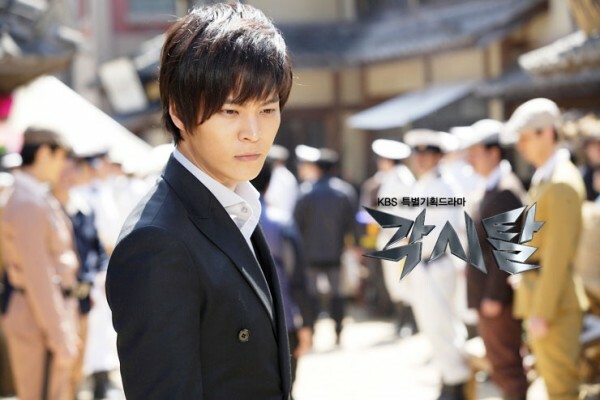 The role played by Joo Won is a special character that experienced change and has unique emotions. So the burden is huge. The environment which the character grew up is the era which never been experienced. In this point, it’s difficult. Joo Won said, “Recently have been adjusting the tone, trying to get as close as possible to the way of speaking during that era. If speaking like modern drama series, it will be unnatural.” Then he added, “The attitude of police, hard tone, speaking using more strength, I still couldn’t get used to it now,” revealing an experience of worrying. “Bridal Mask” succeeded “Man From the Equator“, and is starring Joo Won, Jin Se Yun, Park Ki Woong, Han Chae Ah and other young bloods such as Lee Byung Joon, Chun Ho Jin, Jun Noh Min, Kim Eung Soo and Ahn Suk Hwan. Shin Hyun Joon is making special appearance as the brother of Joo Won until episode 6.